Character dining has become a Walt Disney World must do for my family over the last couple of years. Character dining allows guests to have an up close and very personal experience with some of Walt Disney’s famous characters. This is a great option for guests who may not want to spend their time in the parks waiting in long lines for characters. Let’s be honest, character dining is expensive and some character dining locations are better than others. This being said, it’s important to research character dining locations before committing to that advance dining reservation. I’m here to inform you of a wonderful character dining experience, which I consider to be a hidden gem in the realm of character dining. On my last trip to Walt Disney World this past January, I tried Tusker House located in Disney’s Animal Kingdom. Tusker House is a Harambe marketplace-themed character buffet located in the heart of Africa. Around 10:20 am, we arrived for our 10:30 am breakfast reservation. We were seated right away and were promptly greeted by our server. She took our drink orders and let us know that the chef would be out to visit our table before we headed to the buffet. I have a severe peanut allergy, so my Disney dining experience is always a little different. Luckily, Disney understands the severity of food allergies and is very accommodating for guests with food allergies. A couple minutes later, the chef appeared at our table and personally walked me around the buffet. He pointed out all the different foods that were safe for me to eat and the ones that I should avoid. After my tour of the buffet, I was ready to start piling food on my plate. I was extremely happy with the variety of options Tusker House provides for breakfast. 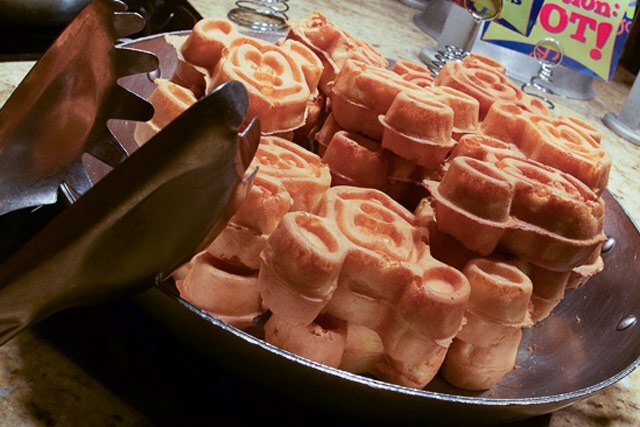 Tusker House has all of the standard American breakfast offerings, bacon, sausage, carved rotisserie honey ham, scrambled eggs, potato wedges, biscuits and gravy, sweet pastries, a fruit and yogurt bar, and of course Mickey waffles! I tried a little bit of everything and thought it was all wonderful. My favorite breakfast item, besides the ever popular Mickey waffles, was the carved rotisserie honey ham. It was tender, savory and there was a hint of sweet from the honey glaze. Since our advance dining reservation was at the tail end of breakfast, we were also able to try some of the lunch offerings. Making a late breakfast reservation is a great option for guests who want to try breakfast and lunch. Keep in mind, this is only applicable to buffet locations that serve both breakfast and lunch. Tusker House offers African themed cuisine at lunch and dinner, although they do still have some standard American cuisine options. Don’t worry, Tusker House also offers kids options for picky eaters. At lunch and dinner, Tusker House offers a variety of seasoned meats including salmon filet, rotisserie chicken and carved top sirloin and pork. Side dishes include, mashed potatoes, green bean medley, potato wedges, basmati rice with almonds, orzo pasta and a variety of salads. It was awesome to try foods influenced by African culture and it really helped to immerse me in the Animal Kingdom experience! My favorite items on the lunch menu were the orzo pasta and the watermelon feta salad. The orzo pasta was served chilled and featured Kalamata olives and feta cheese, with a light lemon dressing. The watermelon and feta salad, also cold, was extremely refreshing. The salty feta cheese complimented the sweetness of the watermelon, sweet pickled red onions and mint. This salad was the perfect ending to my brunch! Last but not least, I can’t forget to mention the characters! If you are looking to meet some of Walt Disney’s classic characters, Tusker House is exactly where you want to go. At Tusker House, you get to meet most of the classic characters without the craziness and chaos of Chef Mickey’s. Tusker House is home to Safari Donald, Daisy, Goofy and Mickey Mouse. 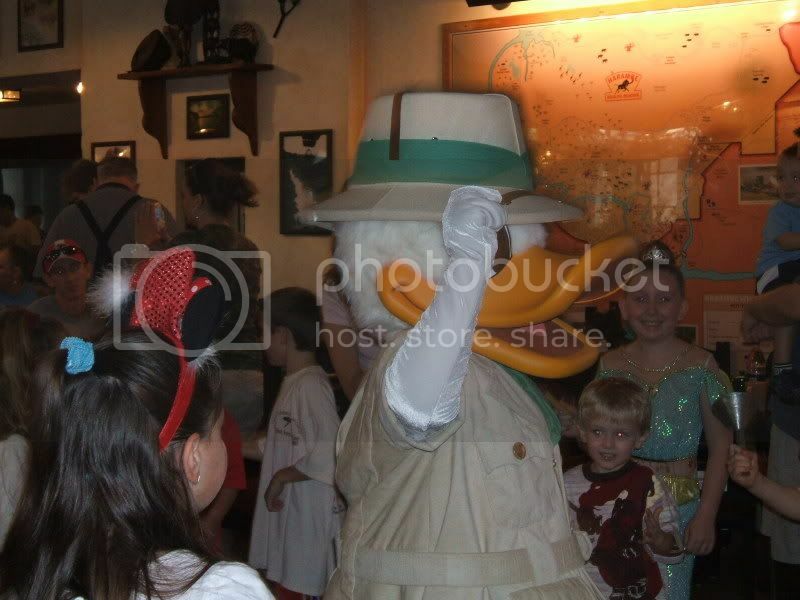 Donald is a hard character to find nowadays, so we were thrilled to see him! All four characters stopped by our table to take pictures with us and were super playful and engaging. Pricing is dependent on the time of year, but can range anywhere from $15-$59.99 per adult, depending on the meal. I felt that I most definitely got my money’s worth, an unlimited amount of delicious food, fun characters and great service! More information about Tusker House or to make an advanced dining reservation.